Teen smoking declined to record-low levels in 2016, according to the latest University of Michigan annual Monitoring the Future Study, which examines youth tobacco, alcohol and drug use (data tables here). 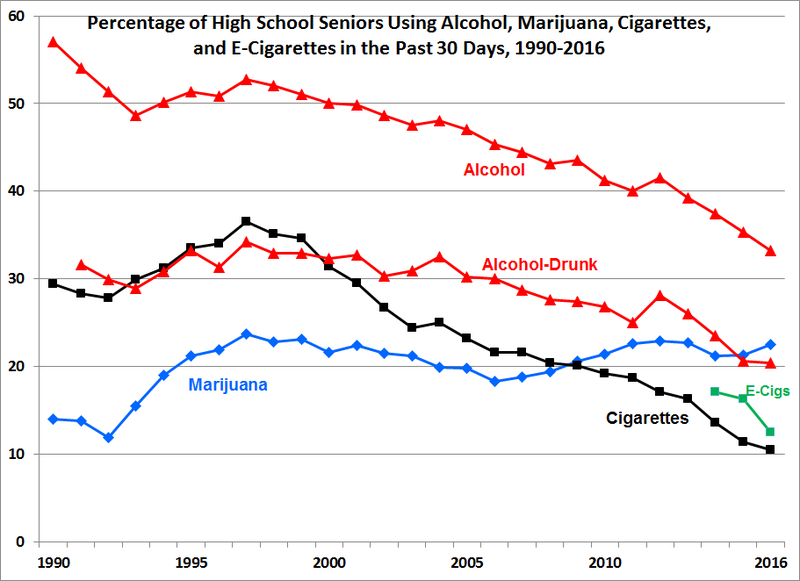 The figure at left shows the percentage of high school seniors using alcohol, marijuana, cigarettes and e-cigarettes in the past 30 days over the period 1990-2016. Cigarette smoking among high school seniors plummeted from 19.2% in 2010 to 10.5% this year. That is, the smoking rate was cut almost in half after e-cigarettes became readily available. E-cigarette use also dropped over the past two years. Days ago, U.S. Surgeon General Vivek Murthy issued a report asserting that e-cigarette use among youth is “a major public health concern.” The report recycles dire warnings about vaping that have been issued by FDA tobacco director Mitch Zeller and CDC director Tom Frieden, despite the lack of evidence of significant health risks associated with e-cigarettes. Those studies were discussed in this blog (here and here). Their omission in the Surgeon General’s report is inexcusable. Why does the government focus on youth as it wars against e-cigarettes? These products are responsible for virtually no health problems and certainly no deaths among youth and young adults. In contrast, the MTF survey documents that alcohol is by far youth’s drug of choice. In 2016, one-third of high school seniors had an alcoholic drink in the past 30 days, and one in five had been drunk, despite laws against underage sales and consumption. Young Americans die from alcohol consumption and abuse. From 2007 to 2014, CDC data (here) shows that accidental alcohol poisoning killed 930 people age 15-24 years. And alcohol also contributes to traffic fatalities. With the exception of the elderly, this age group (15-24 years) suffers the highest death rates due to auto accidents. Comprising just 14% of the U.S. population, this young cohort accounts for 25% of auto deaths (1,544 in 2014). The Surgeon General’s report is the latest in a series of misleading and unsupported tobacco diatribes (here and here). The public would be better served if government committed its limited resources based on the relative impact of a substance on children’s health. Tobacco products should not be ignored, but Dr. Murthy’s report wrongly damns a safer and satisfying product that is currently helping 2.5 million former smokers (here) become or remain smoke-free. Readers who click on the Univ of Mich. 2016 MTF data tables weblink above will be surprised to see that 2014 MTF e-cig prevalence data (that Brad correctly plotted on the graph above) was removed, while 2015 e-cig prevalence data was changed for all three grade levels. Past 30 day vaping by 8th/10th/12th graders combined also fell 29% (from 13.9% in 2014 to 9.9% in 2016). Ironically, the headline of Univ of Michigan's 2016 MTF press release stated "Vaping, hookah use by teens declines for first time"
While the MTF found vaping fell from 2014 to 2015, and fell sharply from 2014 to 2016, the press release's third sentence stated "The rate grew from near-zero levels of use in 2011 to one of the most common forms of adolescent substance use by 2015". "Whether adolescent vaping has peaked or only paused is something we will be able to determine in the coming years," said Richard Miech, a senior investigator in the Monitoring the Future project. The press release then conflated vapor products to far more harmful drugs: "In the past, we have seen new drugs follow a pattern in which use increases at a fast pace during the honeymoon period and then reverses and declines as knowledge of the substance's drawbacks became known." The release then further contradicted MTF's findings (and all other empirical evidence) with "gateway" fear mongering. "One potential harm of vaping is that it may lead to use of regular cigarettes. Miech, who has written on the subject, notes that an increasing number of studies show that vaping predicts future cigarette smoking, even among adolescents who had little predisposition to smoke when they started vaping. "Vaping may lead to friendship networks that encourage vapers to smoke," he said. "Also, vapers may come to believe the danger of smoking are exaggerated if they do not experience any immediate health consequence from vaping." In sum, NIDA and NIDA funded Univ of Michigan anti vaping activists, like many other Obama DHHS agencies and DHHS funding recipients, have repeatedly misrepresented their own scientific and empirical evidence, and have repeatedly lied about lifesaving vapor products. Thanks for exposing the truth.